The sight of a brilliant red squirrel fish out in the open, in daylight, is a rare treat as they are nocturnal. Gollum gets respect from the fish because his hard spines make him an unpleasant meal. Like his namesake in the ‘Lord of the Rings’, Gollum prefers darkness and nighttime. Their daytime vision is poor which results in either shy or inappropriate behavior. He has big dark eyes with a bewildered look. You would not want to hold him because he is spiny, but his vivid red color makes him a favorite. 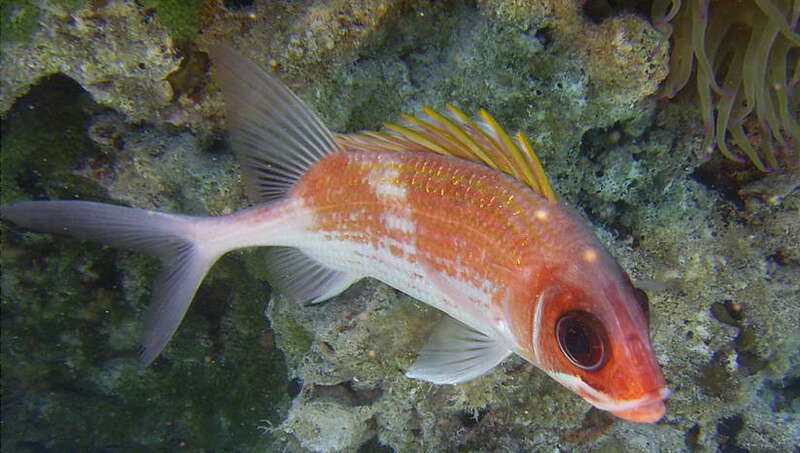 The spiny, nocturnal nature of the squirrel fish is like a double edged sword. On one hand their poor daytime eyesight leads them to swallow hooks, for they can not see the line. The enthusiasm of the fisherman quickly turns to frustrated disappointment. Many, not wanting to pricked by spines, simply whirl the poor fish on the end of the line and slap them on the dock until they no longer move. The fish is then usually stepped on while the hook is removed, and then either kicked overboard or cut up alive for bait. The upside to this situation is that fish are very respectful of them. I have had quite large groupers get chased by squirrel fish. They have no teeth and simply swallow their sleeping prey at night. However, groupers and others can’t eat them becuse of the spines. So remember, you usually pick up the good end of the stick. However, you are still in posession of the bad end as well.